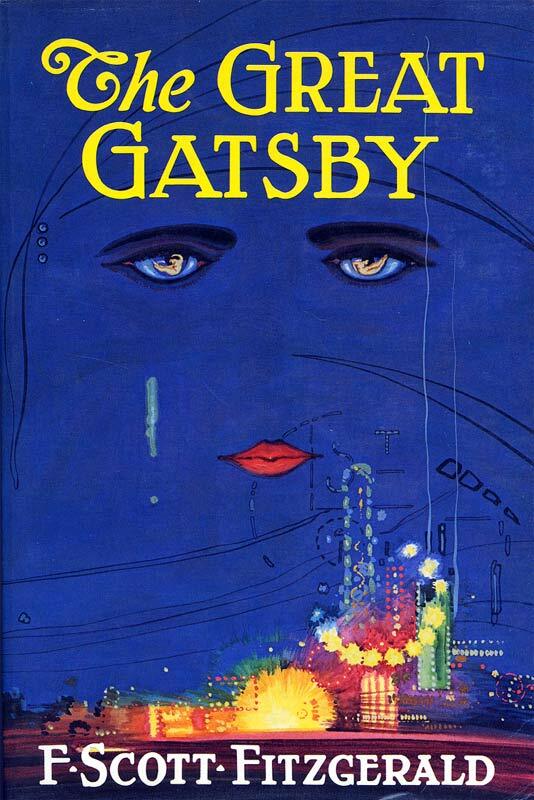 F. Scott Fitzgerald’s The Great Gatsby is one of the most enduring 20th Century novels. First published in 1925, the tragedy lays bare the glamour and perils of pursuing the ever elusive American Dream. In the decades since, the novel has been a staple in the American high school syllabus alongside Mark Twain’s Huckleberry Finn and J.D. Salinger’s The Catcher in the Rye. Every year I teach The Great Gatsby to 11th and 12th graders. One of the first things I point out to my students is the novel’s relevance in today’s world. 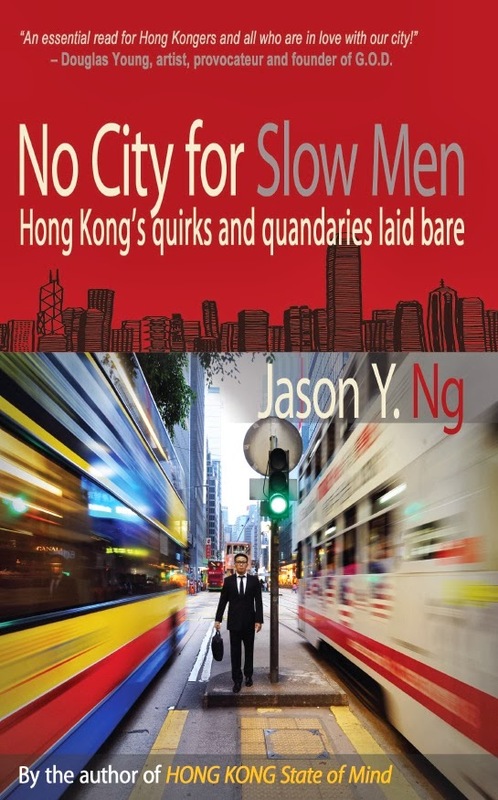 Despite its setting in the Jazz Age – the decade between the First World War and the Great Depression and arguably the most romantic time in all of American history – its depiction of the nouveau riche, the yawning gap between the have’s and the have-not’s and a society on the brink of moral and economic collapse all rings true to observers of Modern China. 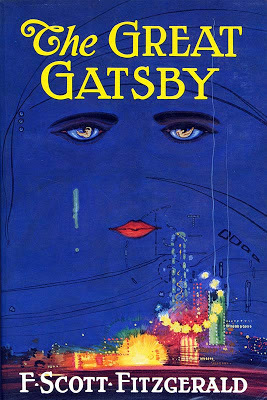 The Great Gatsby has seen multiple film adaptations, most notably the 1974 version starring Robert Redford and Mia Farrow. As if the fifth time is the charm, Australian director Baz Luhrmann, known for his bold spectacles, decides to take another stab at it. Watching a Luhrmann film, whether it is Romeo + Juliet, Moulin Rouge! or the Broadway adaptation of La Boheme, is like going to the Cirque du Soleil. It is an assault on the senses by eye-popping sets, shimmering costumes and a menagerie of musical numbers. 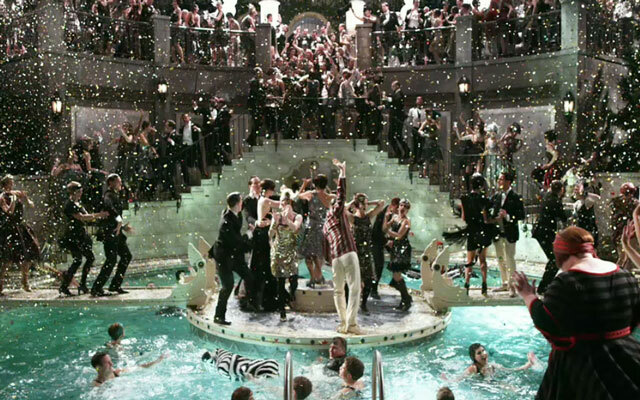 Luhrmann does just that with The Great Gatsby. He turns the volume button way up and drags the color saturation dial to the max. The result is a 3D extravaganza of overflowing champagne, anachronistic hip-hop music and dazzling art deco opulence. The film is every bit as decadent as the Jazz Age itself. Luhrmann by and large stays close to Fitzgerald’s original story, with the exception of the framing device he invents for better story-telling on the silver screen. The film opens with Nick Carraway, the narrator-in-chief, recounting his traumatic experience in New York City from a rehab facility. This then allows the rise and fall of the mysterious billionaire Jay Gatsby to play out in much the same way it does in the novel. Fitzgerald fans will be pleased to see that the movie leaves intact all the literary symbolism that runs through the story, including the green light in East Egg, the clock on Nick's mantlepiece and Dr. T. J. Eckleburg’s giant eyeglasses. Important scenes like the Gatsby-Daisy reunion and the Plaza Hotel confrontation are treated with care and dramatic tension. Almost as twinkling as the Tiffany’s jewelry worn by Daisy is the all-star cast, many of which deliver their career’s best. On that subject, we must start with Leonardo DiCaprio, who is a less detached version of Robert Redford. 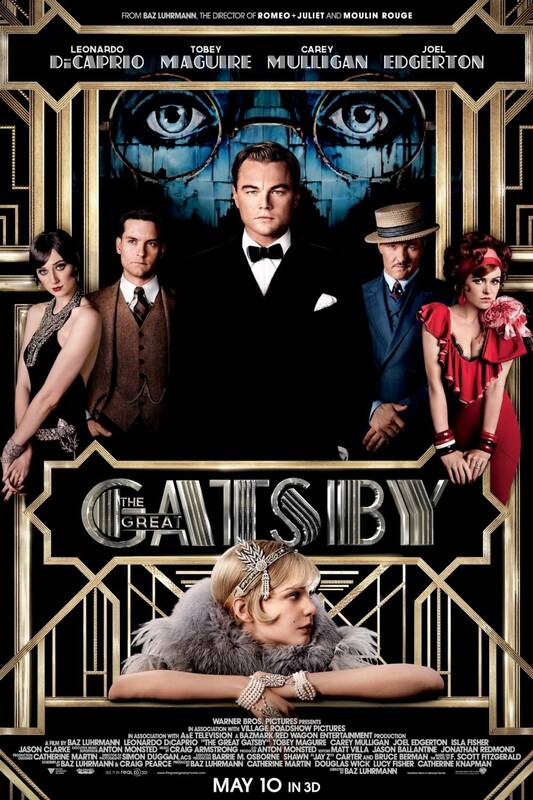 DiCaprio’s Gatsby is at once determined and halting, earnest and evasive, invincible and vulnerable. 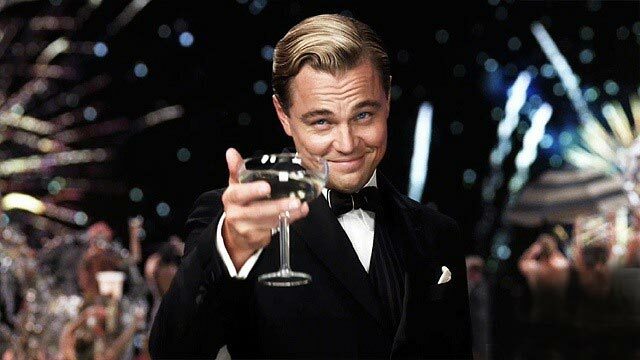 It is the first time I notice DiCaprio as a serious actor rather than just another Hollywood leading man. Tobey Maguire holds his own playing Nick, the observer from “within and without” who takes it all in with equal intrigue and disgust. Australian actor Joel Edgerton also gives a compelling performance portraying the gruff, bigoted scion Tom Buchanan. The only disappointment is English actress Carey Mulligan as Daisy. Looking like a younger version of Michelle Williams, Mulligan comes up short on both looks and gravitas. We can’t comprehend why an extraordinary guy like Gatsby would spend his entire life chasing an ordinary girl like Daisy. Perhaps Scarlett Johansson or Rooney Mara would have been a better casting choice. Worse, Mulligan plays the character as a feeble victim caught in a love triangle instead of a callous accomplice to her contemptible husband. It is where the movie misses the mark. 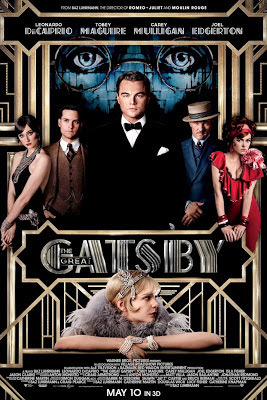 The Great Gatsby is a highly entertaining film that falls short of the serious tragedy that perhaps it never aspires to be. It is more wowing than it is touching. Because of that, the movie has been universally panned by film critics in America. But such is the peril of working with literary classics: everyone has a preconceived notion of what the movie adaptation should look like. I also wonder whether these critics are knocking the movie or Fitzgerald’s novel itself. Indeed, revisionists have long questioned the “greatness” of The Great Gatsby and called it “flawed” and “overrated.” So whether you end up liking the movie – which I did – or hating it ultimately depends on your own assessment of Fitzgerald's works. But I still love Robert Redford in that pink suit. We saw it in Phuket and liked it quite a lot more than we expected to. I had read the bad reviews and was dubious, but Simon talked me into it. It ended up winning me over, although there were times when it felt lopsided, and I think your assessment of Carey Mulligan as the weak spot sums up what didn't work for me. Omw, just before logging on to fb I saw the book in the store and read the back! And now I see your post on the same book! Lol! Watched it 2 days ago. The cinematography and directing in this film was phenomenal! I love the movie and the costume.this is my first time to watch a movie after reading the book.. its a great experience and i found interesting to see how the director interprets the story n each character compared to wat i have in my mind. Thx for your recommendations. Haha! Really want to watch it now after all the above comments. Though my major incentive at first was: this was the book i got examined on in English for my HSC, n i want to see how different the film is to the book n how much i remember abt it. Though as a work of literature, it never impressed me a lot. Enjoyed that. "Can't go wrong with minor flaws" is about right. The flaws were too tiny to detract from a spectacular experience, in my humble opinion. The language applied in the original work is simple enough to understand which makes it suitable for 11th or 12th graders. The deeper meaning of the content is nothing short of those otherwise more elaborated writings. If I recall it, this is one of the representative works of the "Lost Generation" I see a lot more watching this version of the movie than I did with the 1974 adaptation. I agree that Daisy is portrayed rather weak. Other characters come through much more vivid and actually true to Fitzgerald's original creation. I think the movie is ok. They went overboard with the advertisements, but the music, the cinematography and the acting of both Leo and Joe Edgerton saved the day. One minor detail that I did find amusing is how they cast Amitabha Bachan (used to be a very famous Indian actor) as Meyer Wolfshiem. Political correctness? 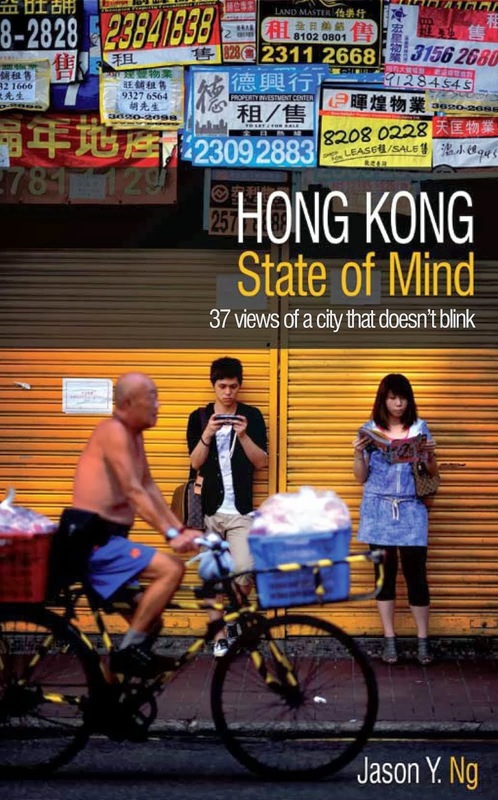 Socio political economic tongue in cheek comment: neither book nor movie can teach Modern China or any other country anything. Most societies (probably all) show a yawning gap between the rich and the poor before collapse. But that's ok, otherwise we would not get Les Miserables and its incredible songs either. In fact since the Japanese economy appear to be tottering as well, we would probably get some incredible play within the next 5 years from that country. It's nice to hear that this is good. I like Leonardo (not 'cos of Titanic, i don't like that movie at all) whenever he has a film these days I will watch. He's just getting better and better. Watched Robert Redford's version on video tape twenty years ago and then read the book ten years later. Both of them were enjoyable. It's a pity that the latest film version didn't impressed me as much. Everything in the movie seems overdone to me. It's a pity that i'm too old to be your student to attend your classes on the book. 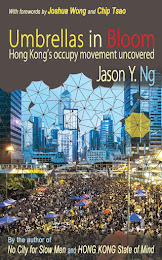 It'd be great if you can launch a public lecture or a book sharing session on this intriguing novel!